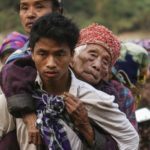 4 Nov 2018 – With the Rohingya set to be sent back to the killing fields of Myanmar, it is stunning how little difference a UN declaration that a genocide was committed against them has made. Myanmar and Bangladesh have agreed to start repatriating Rohingya refugees next month. A list of 8,000 Rohingya refugees has been processed by the Myanmar government and their return has been ‘approved’.